An epidemic has consumed our young. Now it is set to ruin photography as a whole. I’m speaking, of course, about girls making kissy faces and acting like models in every self-taken photo they post on the Internet. The plague has become known simply as Duckface. Perhaps this pose was cute when Audrey Hepburn did it, but it just doesn’t have the same effect if you are holding the camera yourself, standing next to your toilet and wearing your ex-boyfriend’s high school hoodie. What ever happened to smiling? Some may see the death of smiling in photos as a by-product of popular culture, but I think this plague has much deeper roots. When I was growing up in the 1970s and ’80s, it was practically unheard of to take a picture of yourself. Not only was it expensive, but for most people who didn’t have their own darkroom, you’d have to wait several days to see the printed proof of how stupid you look. On top of that, you couldn’t take just one picture and look at it. Believe it or not, kids, but photographs came in groups of 12 or 24 or 36, what was referred to as a “roll” of film. 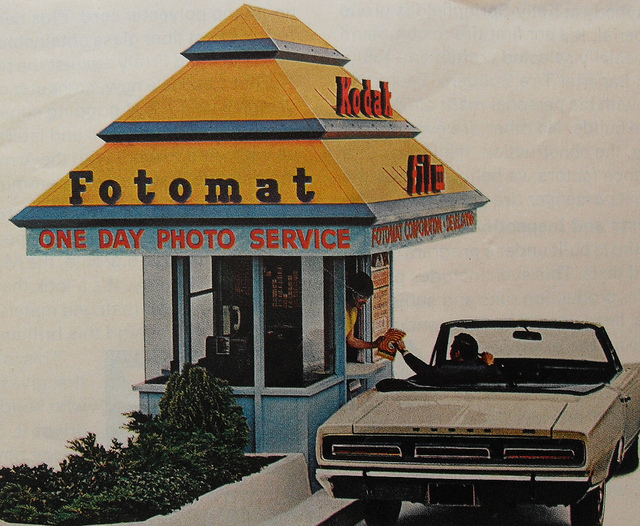 Fotomat drive-thru featuring one-day service. Frackin’ finally! 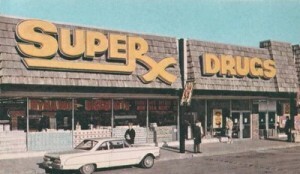 After shooting a dozen or more photos, you’d then drive to the Fotomat or SupeRx drugstore, drop off your film, and come back a few days later to collect your package of photos. Inevitably, there would be fewer prints than the number of pictures you expected because something went wrong. After all the waiting, that highly-anticipated photo you snapped on your school trip to King’s Island of your classmate who you had a crush on, well, it just didn’t turn out. A lot of things didn’t turn out right in those days. If a photo you really hoped for wasn’t in the envelope, you may even resort to looking through the tiny brown and orange negatives that came with your prints to see what happened or to order a reprint. The process of needing to pay someone to develop and print your photos also meant that some strangers somewhere would inevitably see every photo you made. Film photography lacked an entirely different kind of privacy than digital photography. Someone else always saw your pictures before you did. 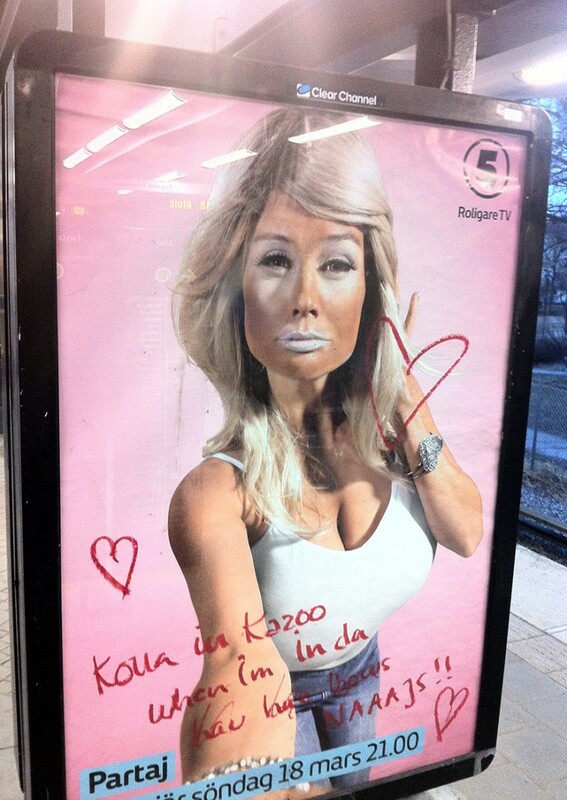 An advertisement for the Swedish comedy sketch show “Partaj” makes fun of “online beauty” and the duckface. Certainly nobody would ever waste the kind of time and money it took to make frivolously large stacks of photographs unless they were as rich as J.R. Ewing or as indulgent as Mackenzie Phillips. But most ragers with that kind of party scratch (these are slang terms) would go the Polaroid route like Richard Pryor and Andy Warhol. 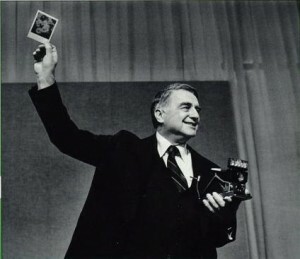 Polaroid was the instant gratification of its day and that luxury came with a premium price tag. For generations, for the vast millions on Earth, the simple truth was that if you owned a picture of yourself it was because you had been in a room with someone else who had a camera. And that photo was taken at least several days ago. Basically, photos were taken by friends, relatives and photographers. These days, that’s not the case. Today, any thuggin’ jackass or too-skinny 15-year-old suburban girl wearing too much makeup can play dress up and smooch to the camera for thousands of followers like she’s Anna Nicole Smith. Don’t do that. Not cute. The main difference, of course, is that if you were Anna Nicole Smith, you would be surrounded by photographers instead of holding the smudged lens on your Nokia Windows phone up to your bathroom mirror. Thanks to digital photography taking pictures has essentially become free… and limitless. As a result, during the past fifteen years, the total number of photographs created each day on Earth has multiplied millions of times over. And the MySpace pose – an arm’s-length self portrait – spread like a disease on photography, even before the duckface entered the frame. 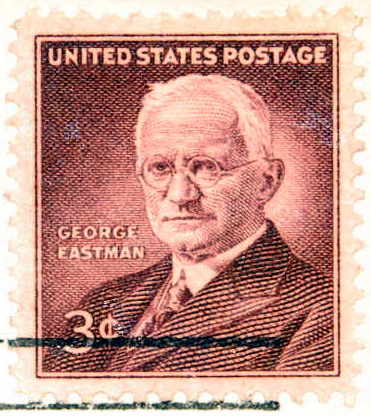 Kodak founder George Eastman. All business. No smile. 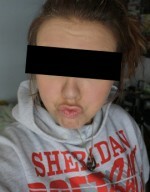 No duckface. Because the Eastman Kodak company is now in bankruptcy protection, you might think the company is a victim of digital photography. In fact, the once-dominant giant in the field of photography brought this on themselves. Through a series of both good and bad decisions and an inability to handle increasingly aggressive competition in the fields they created, Kodak has gotten the short end of several successive sticks. I’d like to show some compassion to Kodak, given their dire straits, however I feel I have no choice but to personally blame them for the perpetuation of the duckface. An early Kodak ad in “The Cosmopolitan.” So easy, even a boy or girl could use it, provided they are in school. Too difficult for dropout losers. George Eastman, the founder of Kodak, patented the roll film camera in 1888. Prior to that, film was produced on large plates treated with chemicals. Making a photograph required time to set up the camera, position the plate, prepare some chemicals, blah blah blah. It could take an hour if everything went smoothly. Eastman’s genius was that he figured out a way to make photo film dry and flexible. This way it could be rolled up. It not only made the film portable, but it also made it possible to take more than one photo quickly once you got the camera set up. His company was a hit and twelve years later, he brought photography to the masses. 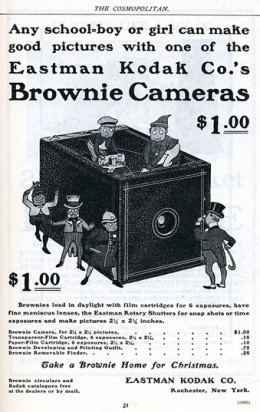 In 1900, Eastman Kodak introduced the Brownie, the world’s first mass-produced, portable camera. That thing was gangbusters. The company expanded quickly as the Brownie did for photography what high-fructose corn syrup did for XXL sweatpants. Kodak was huge, an unstoppable force in photography, and the company didn’t show signs of losing their edge for nearly 80 years. In 1976, Kodak’s dominance comprised of 90% of US of film sales and 85% of camera sales. That’s a position any company would dream of. Essentially untouchable. And they were vigilant to protect their stronghold when Polaroid started gaining a small market share in the seventies. Kodak was already two steps ahead. In 1975, the company assigned a project to one of their young engineers, a 25-year-old recent graduate named Steven Sasson. Steven Sasson is a name everyone should know. Just three years after he began work on the project, he and Kodak were issued a patent for the digital camera. It was a futuristic, game-changing device. 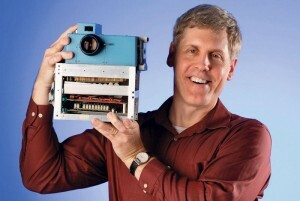 Steven Sasson with his invention, the digital camera. It became even more portable later on, believe it or not. When Apple brought one of the first consumer digital cameras to the market in 1994 – the QuickTake – it was Kodak who was manufacturing the hardware for them. So how is it possible that Kodak has filed for bankruptcy? The company that gave film photography to ordinary people and decades later invented film’s successor – a successor now so ubiquitous that nearly every telephone you see these days is equipped with a Kodak-derived camera – they have somehow dropped some of the world’s most valuable balls. Shockingly, despite Kodak’s forward-looking innovation in the seventies, the company all but abandoned digital photography in the nineties. Way to go, gang. Fearing that the inexpensive nature of digital photos would steal business away from their incredibly profitable film processing business, they doubled down on film. 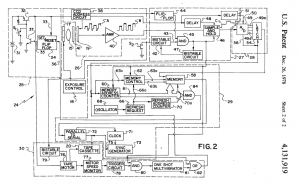 Schematic from Kodak’s US patent for the digital camera, 26 December 1978. Personally, I would have put the sync generator in front of the parallel to serial, but who am I to criticize another man’s work? Basically, they feared that if they marketed cameras that could take an infinite number of photos, it would adversely impact the money they were making by charging people for pictures one at a time. It turns out that they were absolutely right about digital’s impact on film. The irony of course, was that by the time they realized they were right, they had so drastically reduced their digital investment that they were no longer in a position to take advantage of the exploding market they had pioneered. All the profits had moved from the film manufacturing and processing sides of the business to the camera and electronics makers. Kodak’s main competitor in film sales, Fujifilm, had brilliantly played both sides of the game. Through aggressive pricing on the film side, Fuji’s marketshare had been eating into Kodak’s since the company began marketing their film at disruptive prices in the United States. Kodak failed to diversify fast enough, put their investments into things that didn’t work out, and the company was cast into a downward spiral as digital photography grew and the use of film declined. As we now know, today’s reality is that most of the people in the western world have some form of a digital camera in their pocket right now. Many of them will use those Internet-connected devices to post images online several times today. Each one of those pictures – duckfaced or otherwise – represents money that Kodak isn’t making. There really should be truckloads of money being dumped at Kodak’s headquarters in Rochester, New York, every day. Instead, unfortunately, those trucks may soon be hauling off the furniture.